An emergency can be a stressful time, especially with a newborn. 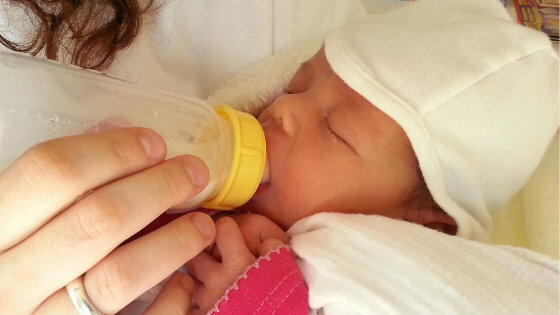 Running out of baby formula or breast milk can make it even more stressful. Luckily, there is an easy way to make emergency baby formula with pantry items that have a long shelf life. The shelf life is key, since it lets us stay prepared without having to constantly stock expiring formula. Baby formula is made in high-tech labs and can’t be reproduced, right? Wrong. Widely available baby formula was not available until the 1950s. Baby formula has been used since the 1920s. So what did everyone do for those 30 years in between? 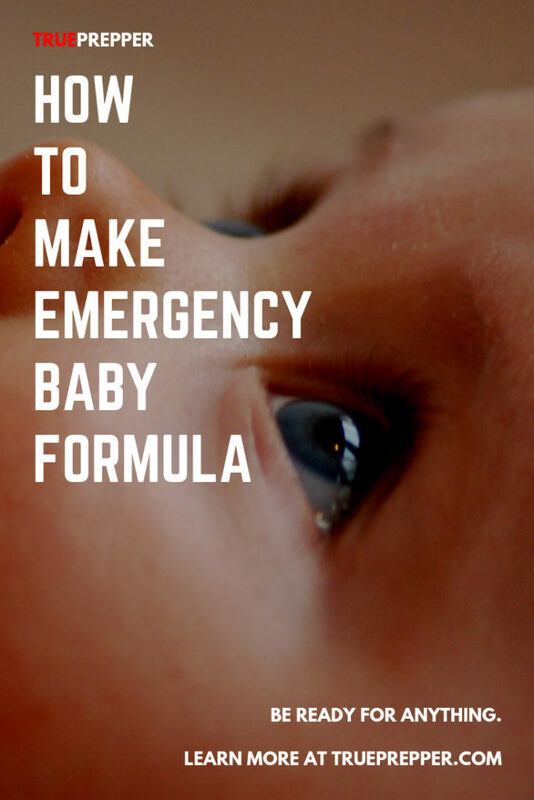 They made their own emergency baby formula. The ingredients are widely available, and you can even stock up on evaporated milk online. Both evaporated milk and sugar can last in the pantry for at least six months, which should carry you through all but the worst case emergencies. The corn syrup was meant to stave off constipation. These days, health services suggest using sugar instead (Alaska DHSS) in homemade baby formulas. You can also tweak the amount of sugar based on your child’s needs. To follow the recipe, you simply combine the ingredients and thoroughly mix. If your infant is larger, you will want to proportionally increase the ingredients, making sure the ratios stay the same. This recipe helps babies gain weight, but does miss out on some of the vitamins and nutrients store-bought formula provides. Vitamin supplements can always be added to the recipe to make up for any deficits. What Can I Substitute For Baby Formula? If find yourself really in a bind without formula or evaporated milk, a few other options could help you out. Breast milk, whole milk, and even goats milk can get the job done if life depends on it. Breast milk – You may be thinking, “Well if I could provide breast milk I would”- but that is not the only source. Sure, you should consider inducing lactation if you are not completely sure that you cannot provide milk. If you are pregnant or have breastfed before, it can take between one and six weeks for milk to start producing. If it doesn’t work for mom, you don’t necessarily need to give up. Any woman with mammary glands could make breast milk. It is, after all, what the glands are meant to do. If a woman has been pregnant in the past it is much easier, but almost any woman can create milk with some work. Having an infant to nurse in regular intervals (even if it is not producing) can help draw the milk in. Whole Milk – Whole milk alone can cause some digestion issues, but for older babies you can start phasing it in. Diluting whole milk with equal parts water allows it to be substituted for the evaporated milk in the emergency baby formula recipe. Once your baby hits one year old, it is generally safe to switch them to undiluted whole milk anyways. Goat Milk – Goats have been a homesteading favorite due to their versatility and ruggedness. 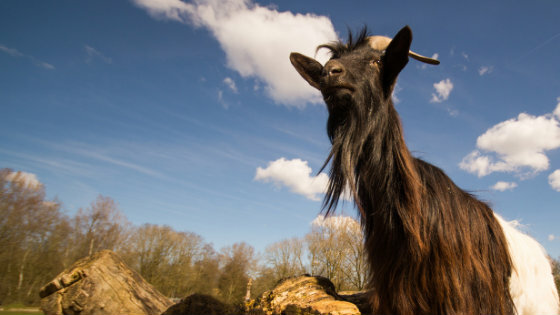 Milk from a goat can be used in an emergency. It isn’t recommended for long-term use (it is low in vitamins B12 and folic acid), but it can get your baby much needed sustenance if there is a disaster. These options may be tougher to come across during an emergency or disaster. Milk and formula are usually a few of the first things to sell out at a grocery store, goats are not exactly found everywhere, and it may be difficult to talk somebody into breastfeeding your baby. Stashing some evaporated milk in the pantry is definitely a good route to go when it comes to being prepared with your little one. Prepping by storing evaporated milk for emergency baby formula is not a topic I thought I would cover when I created this blog, but fatherhood and understanding risks can change things. Other parents should be able to relate with how you want to protect and provide for your children- no matter the situation or disaster. It took some research for me to understand the importance of emergency baby formula, but I appreciated the chance to keep learning about prepping while improving my son’s preparedness. Learn about the risks you could encounter every day with our TrueRisk index to make sure you are on top of every probable and plausible threat. Keep exploring, stay prepared, and be safe.